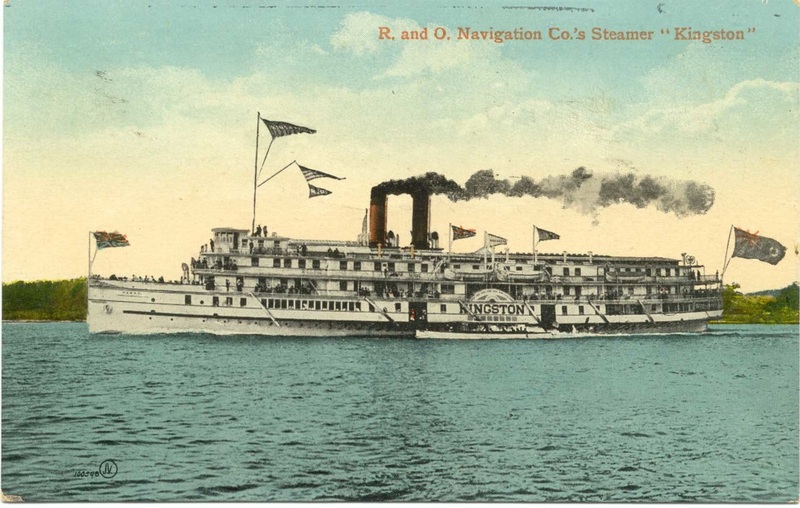 Flames did their first work on the Kingston on a fine summer afternoon in June, 1872, as the liner steamed up the St. Lawrence River from Brockville, bound for Toronto with about 100 passengers and a full cargo of freight. When the ship was only about 12 miles above Brockville the fire was discovered in a stateroom about amidships, directly over the engine room. The flames raced through the wooden superstructure with such speed that Captain Carmichael recklessly drove the Kingston aground on Grenadier Island so the passengers would have a chance to escape. Only one lifeboat was launched. It was filled with women and children. The steamer was still moving and the boat swamped the moment it touched the water. Everybody else jumped overboard and worked their way ashore with the help of floating flotsam and life preservers. All but one of the people on the ship escaped. A passenger, identified as a Mrs. Jones of Montreal, drowned. It was said that she grabbed a life preserver, put it on, and then jumped from the stern of the vessel. Her life preserver wasn’t properly fastened and she didn’t make it to shore. Some reports said a deck hand also drowned, but that story was never confirmed. The propeller Dominion saw the burning hull and stopped to pick up the stranded passengers and crew. They were returned to Brockville that evening. The Kingston was completely rebuilt that fall it it reappeared on the lakes as the Bavarian in November, 1873. This time about 14 passengers and crew members died, including Captain Carmichael, when the vessel again took fire amidships off Oshawa while steaming from Toronto to Montreal. It was determined that the fire began when a heavy iron walking beam, used in driving side-wheeled steamships, broke loose and fell into a cargo of barrels of liquor, which in turn drained into the boiler room below deck. The fire spread so quickly that only two of three lifeboats were safely launched. People jumped into the water to drown before any help arrived. The burned out hull was still afloat when it was towed into Montreal. There the ship was rebuilt once more, probably as a barge and given the name Algerian. One old report said the name was changed again in 1904 to Cornwall. It burned again in 1905. This time the hull was rebuilt as a wrecking tug and operated by a Kingston salvage company. It was declared unseaworthy and purposefully sunk in Lake Ontario in 1928.